All together now – USA! USA! I cried when we landed. And then I cried when I saw our roommate. Then we went to church and I cried and wondered if the man sitting next to me was sort of weirded out. I know there are people who actually go through hard times in their lives – sickness, divorce, poverty, war – so I feel like such a pansy being all, “I went to India and it was really hard.” Seriously, it’s the type of thing ladies who lunch get bent out of shape about. But still, I went to India and it was really hard. And then there’s the fact that I actually am a lady who lunches, so there you go. But I’m done crying now, and while I will eventually move on to more productive activities, for the past few days I’ve busied myself eating $1.49 avocados and non-sour oatmeal and snuggling with my rabies-free cat and dogs (though if they were rabid that’d be cool because Benson and I just got vaccinated (and are worth $1300 more apiece, by the way)). Benson comes from a massive family. I think he has a thousand cousins. Out of that whole family, there’s an obvious star. They’re all lovely, but let’s face it: there has to be a favorite, and my favorite is Benson’s Uncle Jerome. He’s joy-giving. He laughs. He’s humble. He loves Jesus. He’s the one you hope you get to stand by at the kitchen counter while you eat your sweet potato souffle at Maw Maw’s Christmas party. He and his wife run a corn maze in Buford, Georgia. Listen people: When you see Uncle Jerome, it’s like a light shines down from Heaven upon his red hair. I think sometimes a chorus even sings and if you listen very closely, you can hear a fiddle playing. Back to our journey home. We left our apartment at midnight to catch a 4 AM flight. After that first flight from Mumbai to Doha we exited the plane and groggily made our way to a bathroom to brush our teeth and reapply deodorant before the next 17-hour leg. I came out of the bathroom looking for Benson . . .
And there, in the middle of the Doha, Qatar airport a million miles from either of our homes was UNCLE JEROME! He stood with his arm around Benson, tears in both their eyes. I sprinted to him and burst into the happiest, craziest sobs. The three of us clung onto each other, laughing and crying. It was like those viral videos where the soldier surprises his first-grader at the school play, except this wasn’t planned by anyone other than God. Jerome had been traveling in Southeast Asia, had no idea we were flying that day, and certainly didn’t know we’d be in that airport. None of us knew anything except that God had orchestrated it. We asked him how long of a layover he had. His next flight departed in two hours. We looked at our tickets. So did ours. “What gate are you flying out of?” we asked. We searched our tickets again, our brains still buzzy from adrenaline and joy. E2. I knew God was working while we were in India. I didn’t always see it, but I knew it. 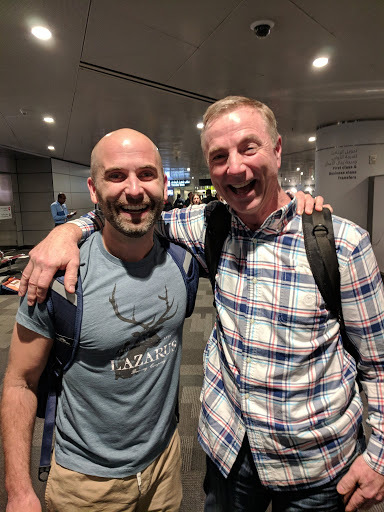 Running into Uncle Jerome in that airport though, and finding out that we had the same layover at side-by-side gates was like God packaging all of His sovereignty into a present just for me. While I sat by Uncle Jerome in his plaid shirt and jeans and red hair and infectious laugh, I thought about the countless details that went into seeing him, and I realized in a right-in-front-of-me way that God knew every street I had crossed in India and knows the ones I will cross in the months to come.